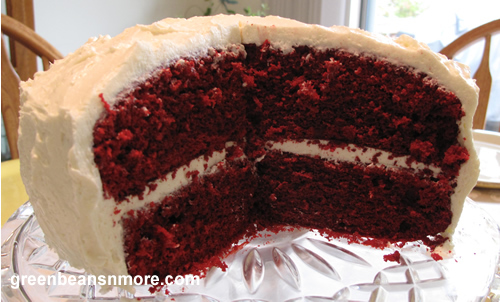 This beautiful cake is the ORIGINAL RED VELVET CAKE RECIPE from the 1940's. Don't bother with any other you see online. Also NEVER, I repeat NEVER put a cream cheese frosting on a Red Velvet Cake! If someone is serving you a Red Velvet Cake with a cream cheese frosting BE AWARE - it is not a true Red Velvet Cake!! This is an impressive cake and the butter cream frosting is no fail. It may take a while to beat it to whipped cream consistency but it's well worth it. Sometimes I make this gorgeous red cake with white icing more festive for Christmas with the addition of green sugar sprinkles on the top! Cream crisco and sugar. Add eggs one at a time and beat for 30 seconds. Add cocoa and red food coloring, mix. Add flour, salt and buttermilk, mix. Remove batter from mixer. Sprinkle with baking soda, pour vinegar over batter and add vanilla. Stir. DO NOT BEAT - (don't over stir - it can make the cake tough). Pour equal amounts of batter into two 9 inch cake pans that have been greased and lightly floured. Bake at 350 degrees for 30 min. Mix cornstarch (or flour) with milk. Cook until thick, whisking the entire time. Set aside to cool. Cream butter and sugar until fluffy. Add vanilla and cooked cornstarch mixture slowly. Beat until it feels like whipped cream. Cook's Tip: If you prefer a whole lot of icing on your cake this buttercream icing recipe can easily be halved to make more without any change in cooking/mixing instructions.